The study is available on-line for download at the NASA Site. Enjoy. I hope you find it useful. 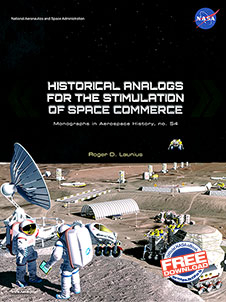 This entry was posted in History, Space and tagged Department of Defense, Earth science, Historical Analogs for the Stimulation of Space Commerce, History, international relations, International Space Station, Moon, NASA, public-privte partnerships, railroads, rural electrification, telephone, Transcontinental railroad, TVA, U.S. Civil Space. Bookmark the permalink. Thanks Roger! I look forward to reading it.